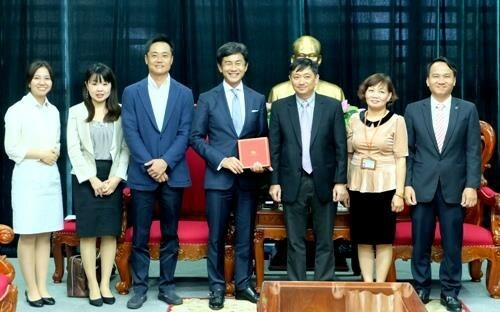 Da Nang (VNA) - Japanese JP Holdings company plans to invest a high quality kindergarten education project in the central city of Da Nang from next year with an estimated capital of 5 million USD. Chairman of JP Holdings, Ogita Kazuhiro said in a meeting with the city's leadership last week. Ogita Kazuhiro said the project will be built in the city in three phases between 2017-19, and provide education facilities for 600 kids with an international education standard. He said JP Holdings focuses on investment in high quality education system with 220 education projects have been developed so far. Vice chairman of the city's people's committee, Dang Viet Dung said the city drew only 12 foreign-invested projects in education with a total investment of 172 million USD. Japanese language teaching has been taught at some junior secondary schools following the city's foreign language teaching programme for 2012-20. In August, the American University in Vietnam – the first education institution under the US curriculum in the central Vietnam – was launched in the city with a total investment of 142.2 million USD in Ngu Hanh Son district.